5 Ways Winter Attacks Your Railroad And How To Fight Back – Spectrum, Inc. This plan should be tailored to the unique needs of each division and reviewed every year. Analyze the impacts of previous winters and draw insight into what methods and resources can be utilized going forward. But don’t wait until winter hits, start as early as you can to give your team time. 1. Make sure your workers have the proper footwear. According to OSHA, slips, trips and falls make up the majority of general industry accidents and 15% of all accidental deaths. Most of these accidents are preventable. Make sure your workers have the proper footwear for icy conditions, i.e. insulated and water resistant boots with good rubber tread. Also, taking shorter, slow steps can help with reaction to traction changes on icy or snow covered surfaces. 2. Keep your workers warm. A major safety concern for those who work outside in the winter is cold stress, examples of which include: trench foot, frostbite and hypothermia. Cold stress can cause permanent tissue damage and even death. Employers should monitor their workers’ physical condition and use radiant heaters to create a warm, dry place for workers to take frequent short breaks. At least three layers of loose fitting clothing for better insulation. A hat that covers the ears (a hat can keep the entire body warmer by reducing the body heat that escapes from the head). 3. Keep your track switches clear. The switch is the area of the tracks that is most susceptible to snow and ice build-up which can cause serious delays and even derailment. Track switch heaters are essential for reliable operation. Crib heaters (also known as ballast or pan heaters) sit between the ties and keep the switch machine control rods free of ice and snow. Hot air blowers produce air blowing directly to the switch points to ensure proper operation of moving parts on the track. Rail heaters transfer heat from the rail to the tie plates. The greater the contact the rail heater has with the rail, the better the heat transfer. A flat design ensures optimal thermal transfer and heater performance. You should plan to install the necessary equipment and be winter-ready as early as possible (late summer or early fall). This will allow you the time to conduct a full inspection and make any repairs as needed. 4. Prevent ice from accumulating on the trains. When temperatures drop below freezing, trains may accumulate ice. As the train passes over the switch, chunks of ice may fall off and jam the switch. 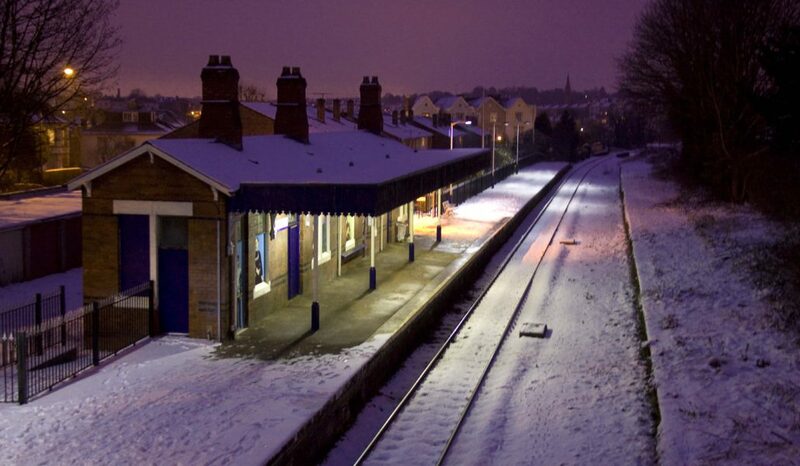 If the trains are running at high frequency, more powerful heaters are recommended to melt the ice quicker. Also, regularly applying the anti-icing chemical ethylene glycol to the underside of the train is a good idea. Frost and ice formation can also wear on the train and cause damage. Driving trains as much as possible, even when empty, can help avoid ice growth. 5. 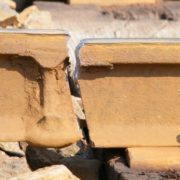 Check for rail breaks and defects. Broken and cracked rail is an unavoidable reality for all railroads. As durable as steel rail is, metal contracts in cold weather and expands in heat. This process creates tension and with time, cracks develop. 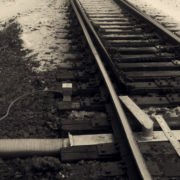 Small cracks weaken the metal further which leads to broken rail. Welded joints are a particularly vulnerable spot on the rail. Because of broken or cracked rail, trains may have to be re-routed or travel at reduced speeds. Additionally, disruptions in signaling systems may arise. While there may not be a way to prevent this natural process from occurring, measures can be taken to minimize its impact. Conduct regular inspections, ideally multiple times per week. Specialized equipment can be used for analysis. Ultrasonic scans can detect internal defects in the rail. When a detect is found, repair it immediately to prevent the rail from further compromise.